If you thought the original Mars graphics card from ASUS was a little bit ridiculous, get ready to see what a lot of ridiculous looks like. The company's Mars II that was recently teased alongside a fresh new Matrix GTX580 Platinum card, squeezes two GeForce GTX 580 chips on the same board and overclocks them for good measure. In order to achieve such great feats, the card requires no less than three 8-pin auxiliary power connectors and takes up the space of three (2.6, to be precise) PCI slots with its ginormous dual-fan cooler. 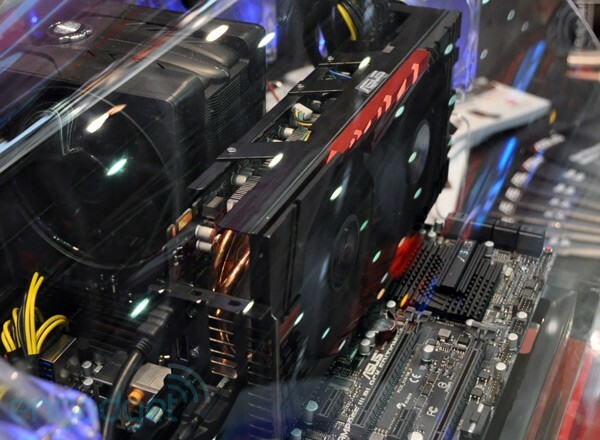 Heatpipes are also employed to keep the raging fires within in check, and -- for situations where all else fails -- ASUS has installed a special red button that sends the fan into full speed when depressed. ASUS hasn't yet finalized how far above the default engine clock speeds the Mars II will reach, but it has a bit of time to figure that out as this extremely limited edition card is coming sometime in July. Buyers in the US, Europe and Asia-Pacific region will have to be quick on their credit card trigger, as only 1,000 Mars IIs will ever be produced. Oh, and if you're wondering how much power a dual-GTX 580 graphics card might consume, the answer is 600W. All by itself. Also making its debut at Computex this week is ASUS' latest offering for the truly overclock-mad PC gamer: the Matrix GTX580 Platinum. Frankly, it feels barren by comparison to its Martian sibling, coming with just one GTX 580 graphics processor, albeit an overclocked one, and the requirement for only two 8-pin connectors for added power. ASUS has thrown in a pair of physical "plus" and "minus" buttons, which permit voltage alterations on the fly, added the same fan override key as on the Mars II, and included a Safe Mode switch at the back in the event that you get carried away with your tweaking. Mashing that last button will reset all clock speeds, voltages and other settings to their default values, which should hopefully let you boot back up and try again. A final note of merit goes to the LED-infused Matrix logo atop the GTX580 Platinum. It's not there just for decorative purposes; its color changes in response to the load the GPU is under, so that blue and green will tell you there are no worries and orange and red will indicate you're cranking it close to its limits. The GTX580 Platinum should start selling worldwide next week, though pricing has yet to be announced. Check it out in closer detail in the gallery below. ASUS Mars II and Matrix GTX580 Platinum eyes-on originally appeared on Engadget on Wed, 01 Jun 2011 13:35:00 EDT. Please see our terms for use of feeds. Just how Exact Are Psyhcic Readings?